CCPD Officer Reyos speaks with a theft victim. At around 4:00 a.m. on Sunday, Jan. 27, a gang of thieves broke into more than 20 vehicles,stealing two from the Aspen Heights apartment complex. The suspects have not been apprehended and authorities warn they could strike again. One of the victims, Anastacia Herrera, described the incident, saying, “I was on my way out to go to work and I saw my car door was partially open. … Then I get in and my glove compartment was wide open.” That is when Herrera realized she had been robbed. 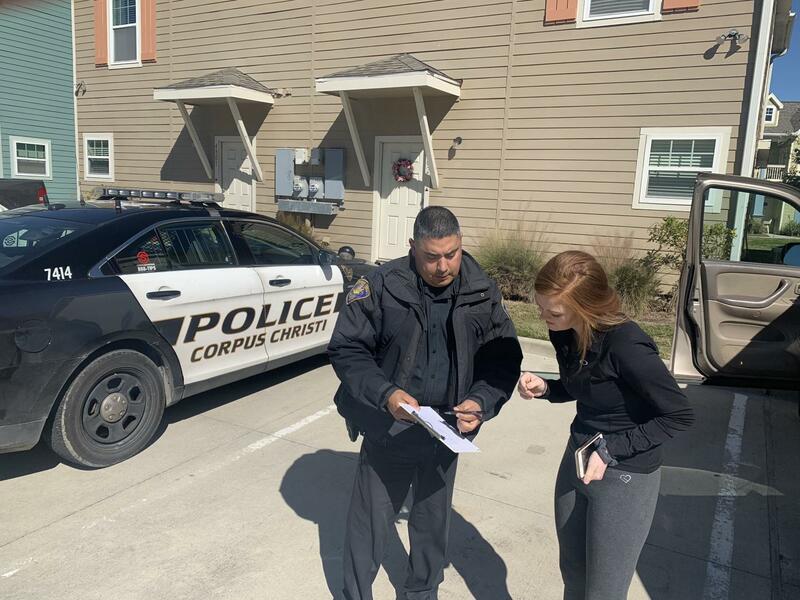 Officer Reyos, Senior Officer for CCPD, was on scene after the incident, taking a police report from Arianna Aloia, another victim of the robberies and photographer for Island Waves. Stay tuned as Island Waves continues to report on the investigation.